A Saint Mary-of-the-Woods College nursing student is the recipient of a sizeable scholarship from a national organization. Terre Haute resident Kristiana Hickenbotham, a junior in SMWC’s on-campus nursing program, has been selected to receive the Johnson & Johnson Nurses Change the World Scholarship by the Foundation of the National Student Nurses’ Association (FNSNA). The scholarship is $10,000 toward tuition. Hickenbotham, 36, is a veteran of the U.S. Army. With the military benefits she has been receiving from the Yellow Ribbon Program —made possible by the post 9/11 GI Bill — expiring in April, she had to look for alternatives in order to complete her degree. Initially stressed about how to finance the rest of her education, she is now relieved and extremely grateful. The FNSNA scholarship, combined with $17,000 worth of scholarships from SMWC, including funds from the endowment and the Dean’s Scholarship, made out-of-pocket expenses for remaining semesters at The Woods more manageable for the mom of two. “My family is very grateful for this as well,” she said. An SMWC education is within reach. The institution has available $7 million in scholarships every year. Ninety-five percent of students receive some form of financial aid. Hickenbotham is also a beneficiary of SMWC’s Ring Scholarship; the brand new Woods Ring she received during last month’s Ring Day was made possible by the generosity of J. Lewis Small Company Inc., the manufacturer of this beloved symbol of the College. “This school has gone above and beyond. It’s amazing the support and the resources SMWC provides to try to help people in my situation,” she said. Attached to Hickenbotham’s FNSNA scholarship application are glowing reviews from C. Christine Delnat, Ph.D., assistant professor of nursing at SMWC and forensic pathologist Dr. Roland Kohr, director of laboratories at Terre Haute Regional Hospital. Both recommenders attested to Hickenbotham’s potential as a nurse leader in the future. 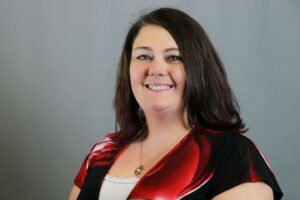 In addition to attending SMWC full-time and caring for her family, Hickenbotham works as a medical laboratory technician and autopsy assistant to Kohr at Terre Haute Regional Hospital. She has an associate’s degree in medical lab tech from Ivy Tech Community College. Thanks to the financial assistance she has received, she is well on her way to becoming a nurse grounded in the values embraced by SMWC. FNSNA honored Hickenbotham and other 2019 scholarship sponsors and scholars during the National Student Nurses’ Association’s 67th Annual Convention Opening Session and Awards Ceremony on April 3, in Salt Lake City, Utah.